What is engineered hardwood? Is it real? 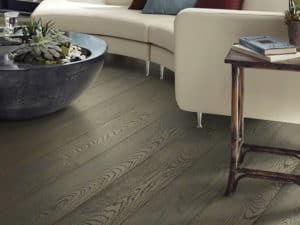 What is engineered hardwood? Is engineered hardwood real? 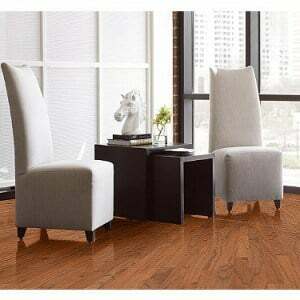 Many customers get confused about laminate flooring vs. engineered hardwood flooring. Which is real? Which is fake? What is the difference? First, laminate flooring is fake. It usually looks like hardwood but it’s not real. It’s a picture of hardwood covered by a melamine wear layer and on top of a high density core board. The pieces click together and lock into place to create a floating floor. Laminate has really come a long way and looks rather real; but, when you walk on it, you can often tell that it’s not real by the clicking noise. It sounds rather tinny and hollow when you walk on it. Often, on closer inspection, you’ll notice that they are wider boards with smaller pieces within them and those pieces all end at the end of the board (rather than hardwood where the boards are staggered). Engineered hardwood, sounds fake, but it’s NOT. It’s hardwood through and through, but it’s constructed in layers (similar to plywood). It’s a terrible term because a lot of customers mistakenly interpret engineered hardwood as fake, but believe me it’s real. Does not require a plywood subfloor. So, if you have a cement floor, you can easily glue or float this floor. Believe it or not, many engineered hardwoods are stronger and more stable than their solid hardwood counterparts. And, because of this strength, it’s easier to go wider in the planks (which is more in style and makes the room look larger). It can be installed below grade (i.e. below the ground level, so it could go in a basement…provided, of course there are no moisture issues). 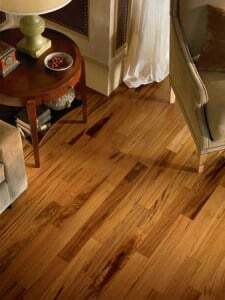 Some engineered hardwoods can be installed over radiant heat. (Always be sure to check this); most solid hardwoods can’t. There’s more flexibility from an installation perspective. With most engineered floors you can nail it (if there’s plywood), or glue it (if there’s cement) or float it. 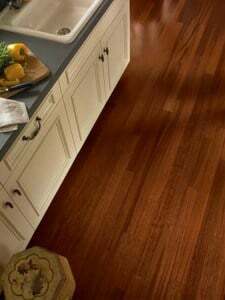 Some engineered hardwoods are less expensive; and, if you don’t have a plywood subfloor, these will also be less expensive from an installation perspective. Some engineered hardwoods can not be sanded & refinished. If you just need the hardwood for a short period of time, this may not be an issue; but, over the long term it can be. Check the wear layer – some engineered hardwoods are top notch and can be sanded 3-4 times; others 1-2 and others can’t be at all. Some engineered hardwoods are in fact very cheap/flimsy products, so be careful and do your homework here. I mentioned above that hardwoods are real through and through – they are just layers of wood. That is usually the case, but there are a few cheap ones out there that have wood filler in them. Some engineered hardwoods (esp the less expensive ones) look more fake because they are rotary sawn (visualize peeling an apple and the wood keeps spinning). For more info on solid vs engineered hardwood flooring read this article. Great article. So many people get it confused when in fact there are so many differences. We get that question all the time and people still call engineered laminate because of the structure. Thanks for this explanation Debbie – I’ve wondered about this, and now I know! Stefan – Yes, I know…I see so many that get these terms confused. Marte – You are welcome! Assuming it is the thicker top, could you refinish engineered floors to go from one extreme, dark wood floors, to the other… very light? If the top wear layer is thick enough, and the engineered floors are either glued or nailed, they can be sanded and refinished. But, if the floors are floated, then no you can’t.